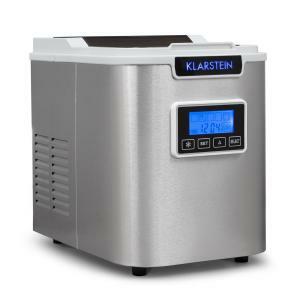 The Klarstein Mr. Black Frost is an ice-cube machine that produces enough ice to cater for small- and medium-sized events. 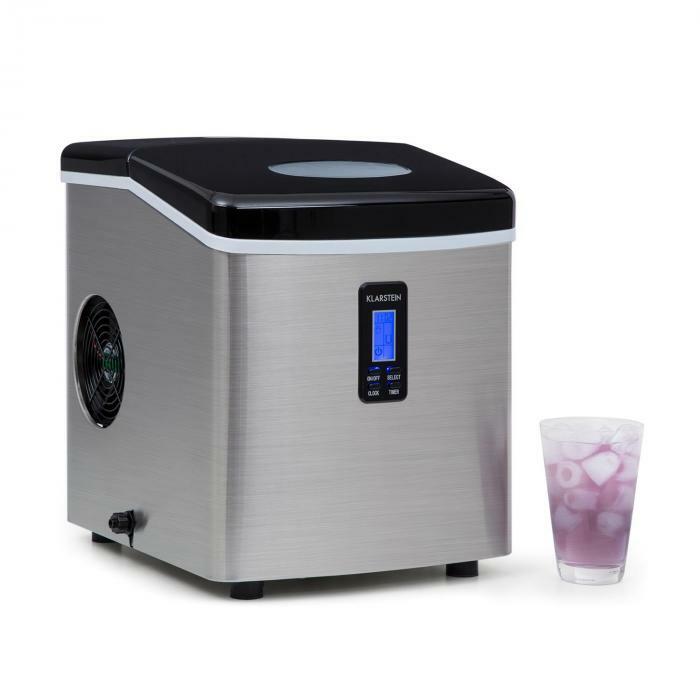 This kitchen and counter-friendly sized device produces about 9 ice cubes in just 13 minutes, which accumulates within 24 hours to about 15 kilograms of ice. The powerful 150 watt unit operates with relatively little noise, so as not to disturb conversations at the bar or party. 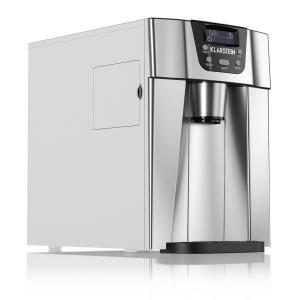 Technical operation of the Klarstein Mr. Black Frost ice machine is simple with the easy-to-understand 4-button panel, allowing you to select between three different ice cube sizes with the press of a button. A transparent window on top of the device clearly shows the remaining amount of ice in the machine. 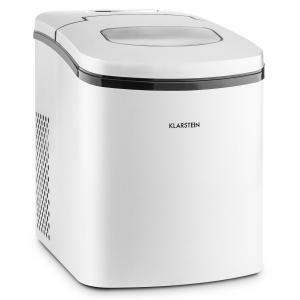 The workmanship of the Klarstein ice cube maker has an inner lining and a pumping system that are naturally odourless and tasteless. 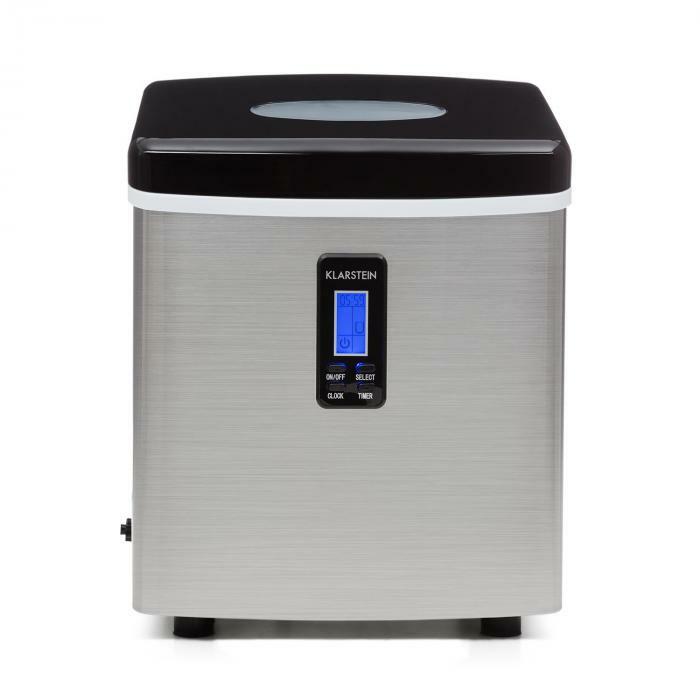 The Klarstein Mr Frost is an ice making machine that can sit on your worktop, table or bar and will enable you to produce around 15kg of ice throughout the day. Note - This machine comes with a European type 2 pin plug attached. You will need to buy an adapter to convert this to a UK 3 pin plug. This machine is delivered with a thin film of blue plastic adhered to the stainless steel in order to protect it. It took me around five mins to peel it all off properly. Also don't forget to clean the inside before use! 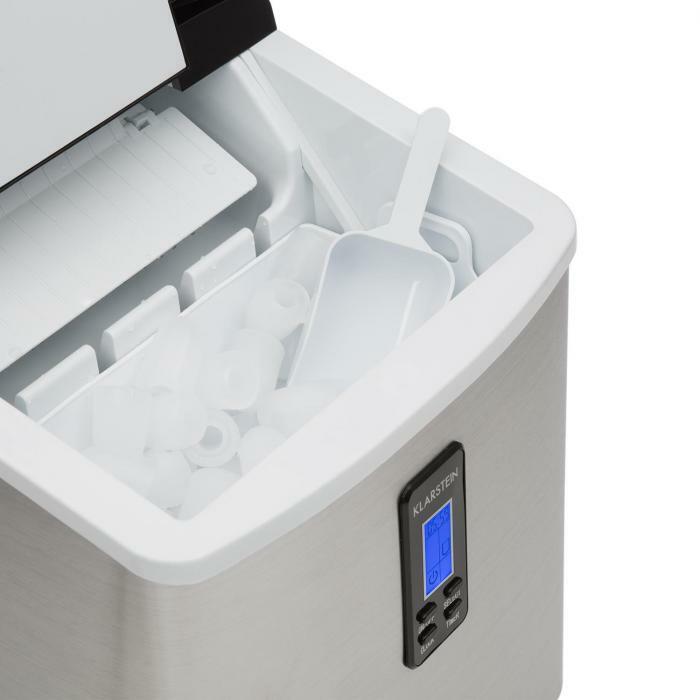 The Ice machine is made from stainless steel with a food grade (taste/odour free) easy clean white plastic lid and inner body. 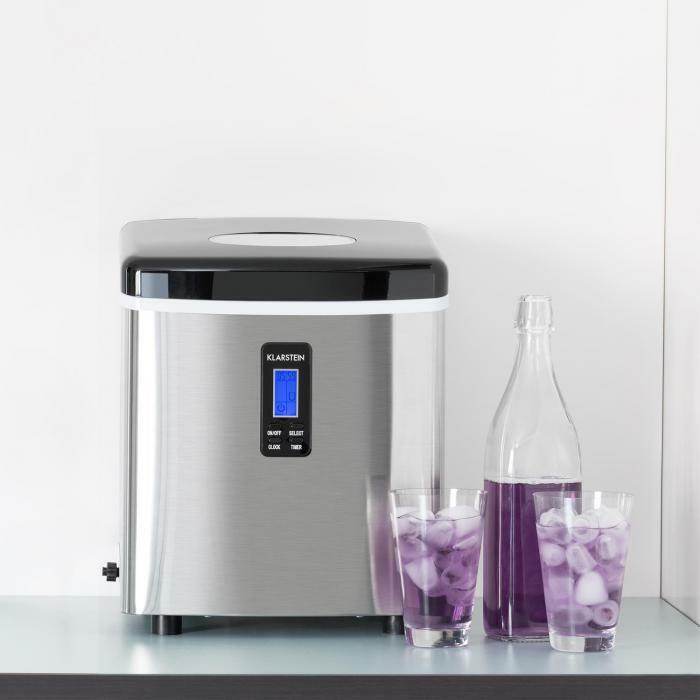 Inside you have the water reservoir with a max fill line and a removable ice basket with scoop, that is it! On the front of the machine is a four button backlit LCD control panel. It also has four very substantial rubber feet on each corner and a drain valve on the outside bottom. This is a very easy machine to operate. You just plug it in and press the power on button, the LCD screen will light up blue, set the time and you're good to go! Open the lid take the basket out and fill the reservoir with water up to the max fill line which is around 3.3 Litres. Close the lid then press 'on'. The machine will kick in so now choose your ice size on the LCD panel. That is it, you're now making ice 'bullets!' I say bullets as this is the shape of these rather than a cube (all these types of machine make them this shape). How it works is that a small pump takes water from the reservoir and fills a trough at the top. 9 metal rods descend into the trough and quickly become freezing cold. 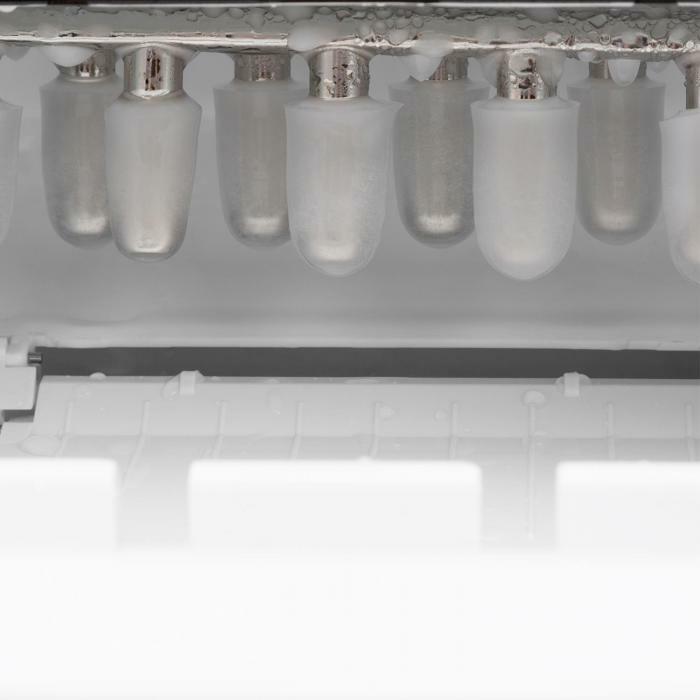 The water solidifies around them and when ready the machine ejects them off into a collection tray. An automatic scoop then pushes them off into the ice basket and so the process continues. I found that it took 9 mins to produce 9 small ice bullets. It took 11 mins to produce 9 large ones. And so this is repeated every 9 - 11 mins. Pretty quick and efficient in my book! Four large ice bullets was plenty to make a pint of orange juice icy cold within minutes and they didn't melt noticeably quicker than a cube! After two hours I had around 100 plus large ice bullets bagged up in my freezer ready to go. Enough to be getting on with! I will put some pics up of the ice being made and their sizes. Just keep an eye on the water level and top it up if using for mass production. The machine will tell you if the reservoir is empty anyway or the basket is too full. There is also a viewing window so you can check everything is okay. 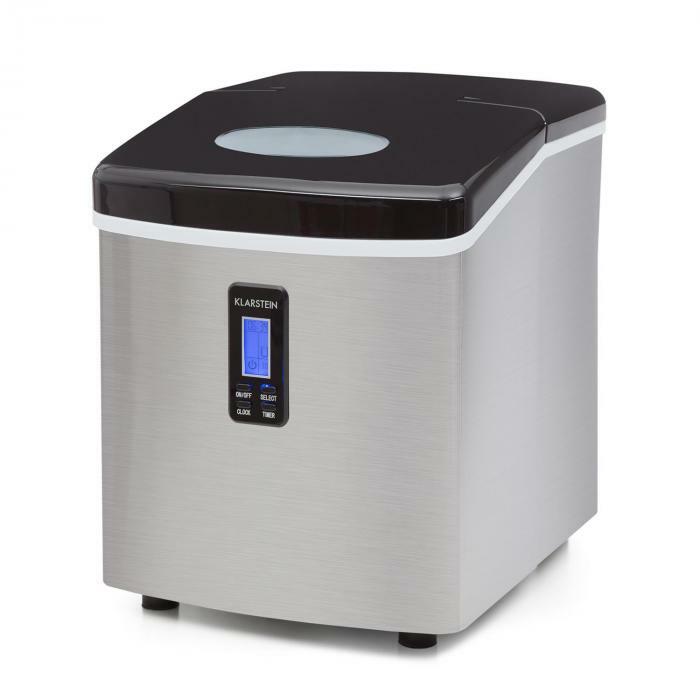 This is perfect for churning enough ice out for a social gathering at the home, garden or for filling cooler boxes and to make ice for smoothies.To clean this unit I would use some warm water with a squeeze of lemon juice to keep it natural and fresh. This is a cracking little quiet running machine that I'm now wondering how I ever coped without during these hot weather spells!